Tuesday evening saw the first ever @AfNutr Chat. After a few months of planning, finally the day came for the real thing and we moderators were a little nervous. The number of followers grew so much in the run up, this was not going to be a gentle entry into running a twitter chat. I am so glad that I had a play with Tweetdeck beforehand and scheduled tweets to pop up during the chat (who even knew you could do that!!). To date we have 464 followers. If you are a Twitter fan then check out #AfNutrChat to see what we talked about. On the night, it was impossible to keep up with people’s comments, I seemed to be about 10 minutes behind the whole way through. I think we hit on something that people really want and I am not sure I really appreciated how useful people would find it. We wanted to create a place where RNutrs and ANutrs could connect in an informal friendly way, across all specialisms and levels of experience. We wanted to show case who we are and what we do for non-nutritionists (not sure how many non-nutritionists joined us or followed the thread this time though). 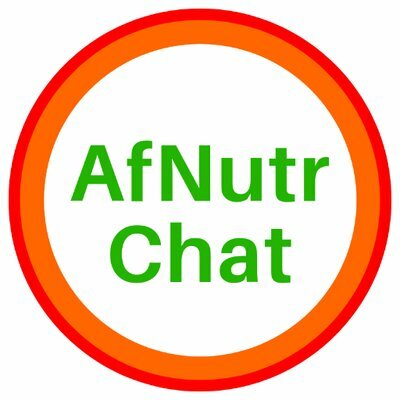 We wanted to make the chat a useful contribution to Continued Professional Development, which can be so difficult for many ANutrs and RNutrs to get for a variety of reasons. Thanks to all those people who took part and contributed, we seemed to achieved some of that. We had animal nutritionists, researchers, students, people working in food tech and reformulation, sports nutritionists, dietitians, people from all over the UK and beyond (lucky souls tuning in from far flung places like Laos and Costa Rica – so my location just outside Paris was a bit dull!). People told us at the end how great it was to have a platform to exchange information with each other. Some people had a platform to share and advertise their own CPD events, newly qualified nutritionists were connecting with people to help with their journey to full registration, experienced nutritionists were sharing information about recording CPD. It was a real buzz that it went so well. It was so lovely to read the thanks and positive comments at the end. So put the 19th Feburary, 8-9pm UK time, into your diary for a fibre fest #fibrefeb. The questions will be put up on the website beforehand (and we may even tweet a screenshot of them too). Hopefully, the next one will be just as good – the bar has been set pretty high. So I will still be nervous! What have I learned? To take a chance on an idea with like minded people. Being a moderator has opened up lots of learning for me – not just thinking about nutrition but using Twitter as a learning tool, developing a website, project working with people at a distance, working on a social media campaign. If you are working free lance or maybe on a career break, the only nutritionist in a company, to work on something like this or helping with a regional AfN group is a great way to connect with people and achieve something a little different. It certainly has boosted my confidence. I feel more ready to start some new things. My tips for participating in a Twitter Chat would be to look at the questions beforehand – you can even be super organised and schedule answers to questions that may take a while to put together or links to share. Remember to hashtag your answers so that when we archive the chat your tweets will be gathered in that process and so that people following the hashtag can see your points. Although the chat is an hour long there are people commenting and retweeting for a good while afterwards so worth another look later on, especially if you really want to follow up the things people shared. So on Feb 19th, get prepared, make yourself a drink, get comfy and enjoy. See you then. Previous Post Veganuary – why is 2019 the biggest year yet?